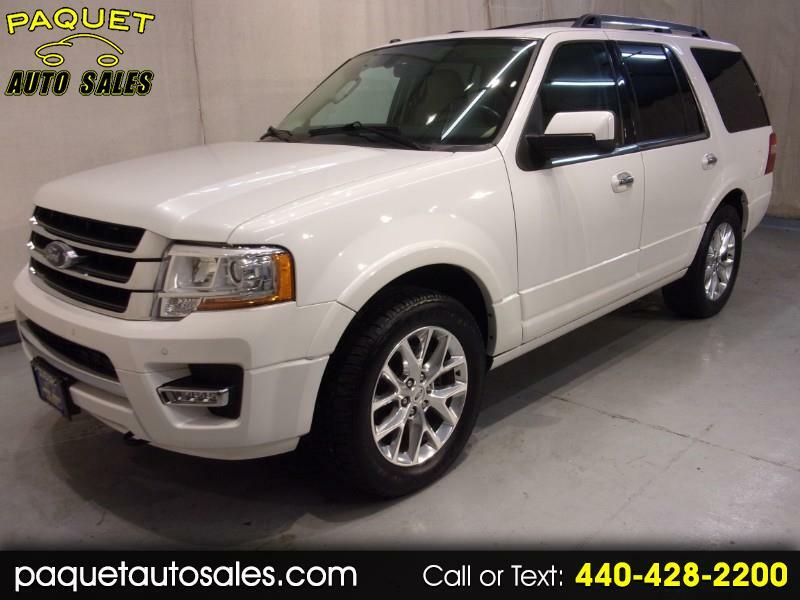 3RD ROW SEATING---NAVIGATION---HANDSFREE PHONE---SYNC BLUTOOTH WITH VOICE ACTIVATION---FOUR WHEEL DRIVE---ONE OWNER---CLEAN CARFAX REPORT---LEATHER AND SUNROOF---ECOBOOST 3.5 LITER V6---REMOTE START---BACKUP CAMERA--- 2015 FORD EXPEDITION LIMITED 4-door in a white metallic exterior finish with power running boards, tinted rear windows, 20' polished aluminum alloy wheels, chrome grill, luggage rack with chrome side rails, power rear hatch with remote operation, push button start, front and rear parking sensors, front tow hooks, trailer tow package with hitch and electric brake controller, body color power folding exterior mirrors with blind spot detection and turn signals, pop up rear window with wiper, keyless entry with multi-function remote and door mounted numeric keypad. A clean SUV both outside and inside where you will find a loaded tan leather interior featuring powered, heated and cooled front bucket seats with headrests and driver's memory settings, power adjustable pedals, power windows, door locks and exterior mirrors, center console/armrest with storage and illuminated cupholders, overhead sunglass holder with reading lights, dual lit vanity mirrors, power tilt and telescopic steering wheel with mounted stereo, cruise, information, voice and phone controls, air conditioning with dual climate control, rear air with controls, digital tachometer, vehicle information, clock, compass, external temperature, media and climate display, Sony touchscreen CD/HD Radio/Satellite ready media player with SD card, Bluetooth, Handsfree Phone, Navigation, Apps. and aux. input, USB ports, rear stereo controls and 110 volt A/C power outlet, heated folding 2nd row split seats with headrests, rubber floor mat set, power folding split 3rd row seating with folding headrests, cargo area floor storage compartment, rear window defroster. Fully inspected by our service technician. Detailed inside and out and ready for delivery. Stop in or call today and speak with one of our friendly sales staff with any questions that you may have.